About a month ago, I spent a morning down at the beach, walking along the sand, letting the crisp, cold water lap against my feet. It was tranquil, relaxing. I then took out my iPhone and snapped a few photos of the ocean and clouds passing by. You know, something to remember the moment by. Because I knew that as soon as I got back to the office, that my nose was going back on the grindstone. Back at home, I imported my photos to my laptop and thought, hey, there must be a way to take this picture of the beach that I took during the mid-morning and make it look like it was taken at dusk. And since I’m a computer vision scientist, I certainly wasn’t going to resort to Photoshop. No, this had to be a hand engineered algorithm that could take two arbitrary images, a source and a target, and then transfer the color space from the source image to the target image. A couple weeks ago I was browsing reddit and I came across a post on how to transfer colors between two images. The authors’ implementation used a histogram based method, which aimed to balance between three “types” of bins: equal, excess, and deficit. The approach obtained good results — but at the expense of speed. Using this algorithm would require you to perform a lookup for each and every pixel in the source image, which will become extremely expensive as the image grows in size. And while you can certainly speed the process up using a little NumPy magic you can do better. Much, much better in fact. What if I told you that you could create a color transfer algorithm that uses nothing but the mean and standard deviation of the image channels. That’s it. No complicated code. No computing histograms. Just simple statistics. And by the way…this method can handle even gigantic images with ease. 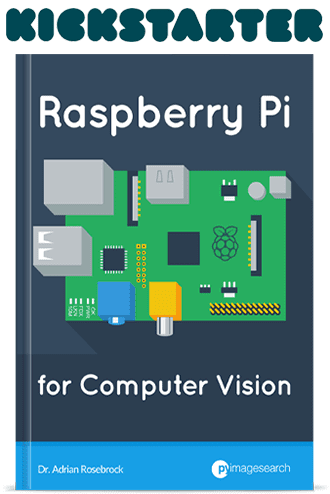 You can also download the code via GitHub or install via PyPI (assuming that you already have OpenCV installed). My implementation of color transfer is (loosely) based on Color Transfer between Images by Reinhard et al, 2001. In this paper, Reinhard and colleagues demonstrate that by utilizing the L*a*b* color space and the mean and standard deviation of each L*, a*, and b* channel, respectively, that the color can be transferred between two images. Step 1: Input a source and a target image. The source image contains the color space that you want your target image to mimic. In the figure at the top of this page, the sunset image on the left is my source, the middle image is my target, and the image on the right is the color space of the source applied to the target. Step 2: Convert both the source and the target image to the L*a*b* color space. The L*a*b* color space models perceptual uniformity, where a small change in an amount of color value should also produce a relatively equal change in color importance. The L*a*b* color space does a substantially better job mimicking how humans interpret color than the standard RGB color space, and as you’ll see, works very well for color transfer. Step 3: Split the channels for both the source and target. Step 4: Compute the mean and standard deviation of each of the L*a*b* channels for the source and target images. Step 5: Subtract the mean of the L*a*b* channels of the target image from target channels. Step 6: Scale the target channels by the ratio of the standard deviation of the target divided by the standard deviation of the source, multiplied by the target channels. Step 7: Add in the means of the L*a*b* channels for the source. Step 8: Clip any values that fall outside the range [0, 255]. (Note: This step is not part of the original paper. I have added it due to how OpenCV handles color space conversions. If you were to implement this algorithm in a different language/library, you would either have to perform the color space conversion yourself, or understand how the library doing the conversion is working). Step 9: Merge the channels back together. Step 10: Convert back to the RGB color space from the L*a*b* space. I know that seems like a lot of steps, but it’s really not, especially given how simple this algorithm is to implement when using Python, NumPy, and OpenCV. If it seems a bit complex right now, don’t worry. Keep reading and I’ll explain the code that powers the algorithm. 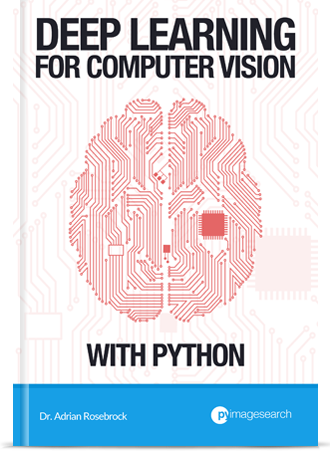 I’ll assume that you have Python, OpenCV (with Python bindings), and NumPy installed on your system. If anyone wants to help me out by creating a requirements.txt file in the GitHub repo, that would be super awesome. I have created a PyPI package that you can use to perform color transfer between your own images. The code is also available on GitHub. Lines 2 and 3 import the packages that we’ll need. 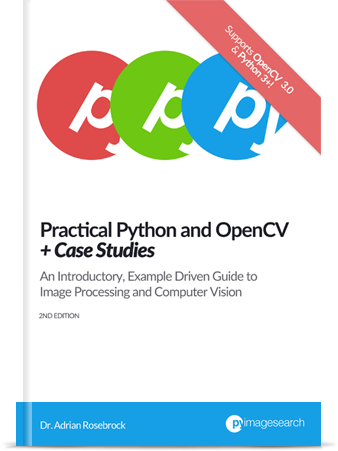 We’ll use NumPy for numerical processing and cv2 for our OpenCV bindings. From there, we define our color_transfer function on Line 5. This function performs the actual transfer of color from the source image (the first argument) to the target image (the second argument). The algorithm detailed by Reinhard et al. indicates that the L*a*b* color space should be utilized rather than the standard RGB. To handle this, we convert both the source and the target image to the L*a*b* color space on Lines 9 and 10 (Steps 1 and 2). OpenCV represents images as multi-dimensional NumPy arrays, but defaults to the uint8 datatype. This is fine for most cases, but when performing the color transfer we could potentially have negative and decimal values, thus we need to utilize the floating point data type. Lines 13 and 14 make calls to the image_stats function, which I’ll discuss in detail in a few paragraphs. But for the time being, know that this function simply computes the mean and standard deviation of the pixel intensities for each of the L*, a*, and b* channels, respectively (Steps 3 and 4). Now that we have the mean and standard deviation for each of the L*a*b* channels for both the source and target images, we can now perform the color transfer. On Lines 17-20, we split the target image into the L*, a*, and b* components and subtract their respective means (Step 5). From there, we perform Step 6 on Lines 23-25 by scaling by the ratio of the target standard deviation, divided by the standard deviation of the source image. Then, we can apply Step 7, by adding in the mean of the source channels on Lines 28-30. Step 8 is handled on Lines 34-36 where we clip values that fall outside the range [0, 255] (in the OpenCV implementation of the L*a*b* color space, the values are scaled to the range [0, 255], although that is not part of the original L*a*b* specification). Finally, we perform Step 9 and Step 10 on Lines 41 and 42 by merging the scaled L*a*b* channels back together, and finally converting back to the original RGB color space. Lastly, we return the color transferred image on Line 45. Here we define the image_stats function, which accepts a single argument: the image that we want to compute statistics on. We make the assumption that the image is already in the L*a*b* color space, prior to calling cv2.split on Line 49 to break our image into its respective channels. From there, Lines 50-52 handle computing the mean and standard deviation of each of the channels. Finally, a tuple of mean and standard deviations for each of the channels are returned on Line 55. To grab the example.py file and run examples, just grab the code from the GitHub project page. Figure 1: The image on the left is the source, the middle image is the target, and the right is the output image after applying the color transfer from the source to the target. Notice how a nice sunset effect is created in the output image. Notice how the oranges and reds of the sunset photo has been transferred over to the photo of the ocean during the day. Figure 2: Using color transfer to make storm clouds look much more ominous using the green foliage of a forest scene. Here you can see that on the left we have a photo of a wooded area — mostly lots of green related to vegetation and dark browns related to the bark of the trees. And then in the middle we have an ominous looking thundercloud — but let’s make it more ominous! If you have ever experienced a severe thunderstorm or a tornado, you have probably noticed that the sky becomes an eerie shade of green prior to the storm. As you can see on the right, we have successfully mimicked this ominous green sky by mapping the color space of the wooded area to our clouds. Figure 3: Using color transfer between images to create an autumn style effect on the output image. Here I am combining two of my favorite things: Autumn leaves (left) and mid-century modern architecture, in this case, Frank Lloyd Wright’s Fallingwater (middle). The middle photo of Fallingwater displays some stunning mid-century architecture, but what if I wanted to give it an “autumn” style effect? 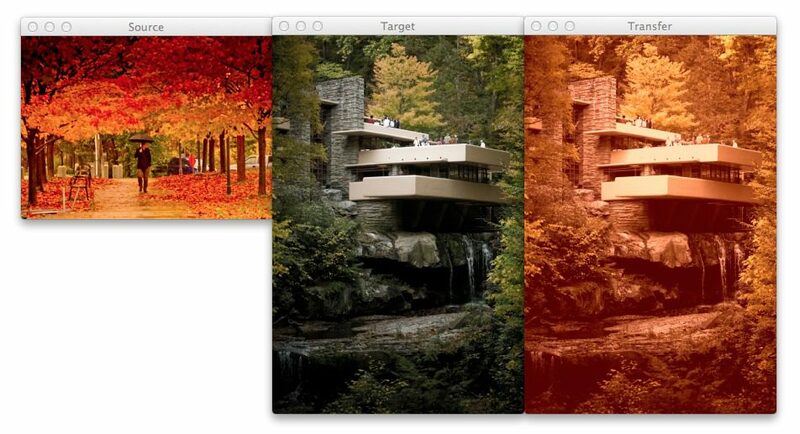 You guessed it — transfer the color space of the autumn image to Fallingwater! As you can see on the right, the results are pretty awesome. While the Reinhard et al. algorithm is extremely fast, there is one particular downside — it relies on global color statistics, and thus large regions with similar pixel intensities values can dramatically influence the mean (and thus the overall color transfer). Option 1: Compute the mean and standard deviation of the source image in a smaller region of interest (ROI) that you would like to mimic the color of, rather than using the entire image. Taking this approach will make your mean and standard deviation better represent the color space you want to use. Option 2: The second approach is to apply k-means to both of the images. You can cluster on the pixel intensities of each image in the L*a*b* color space and then determine the centroids between the two images that are most similar using the Euclidean distance. Then, compute your statistics within each of these regions only. Again, this will give your mean and standard deviation a more “local” effect and will help mitigate the overrepresentation problem of global statistics. Of course, the downside is that this approach is substantially slower, since you have now added in an expensive clustering step. 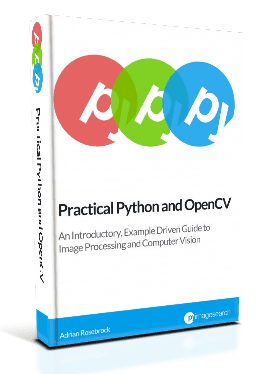 In this post I showed you how to perform a super fast color transfer between images using Python and OpenCV. I then provided an implementation based (loosely) on the Reinhard et al. paper. Unlike histogram based color transfer methods which require computing the CDF of each channel and then constructing a Lookup Table (LUT), this method relies strictly on the mean and standard deviation of the pixel intensities in the L*a*b* color space, making it extremely efficient and capable of processing very large images quickly. If you are looking to improve the results of this algorithm, consider applying k-means clustering on both the source and target images, matching the regions with similar centroids, and then performing color transfer within each individual region. Doing this will use local color statistics rather than global statistics and thus make the color transfer more visually appealing. Looking for the source code to this post? Just head over to the GitHub project page! G’MIC has a filter named Transfer Color : https://secure.flickr.com/groups/gmic/discuss/72157625453465326/. Even if you’re not a photoshop guy, I believe G’MIC is very interesting. Wow, thanks for the link. This is some really great stuff. I’ve done something similar (almost a clone of your program) but using YCbCr color space: https://github.com/damianfral/colortransfer. The results are pretty similar, but I see “my version a little bit more saturated. The YCbCr color spaces, unlike Lab, is linear, so transforming RGB to YCbCr (and viceversa) has less complexity than transforming from RGB to Lab, which could give us a performance improvement. Very cool, thanks for porting it over to Haskell. And I’m glad you like the articles! Hi Thanks for the article, very clear & useful. Also, any reason not to use *= ? Hi rb, thanks for the comment. Take a look at the original color transfer paper by Reinhard et al. On Page 3 you’ll see Equation 11. This is the correct equation to apply, so the scaling is not inverted, although I can see why it could see confusing. Also, *= could be used, but again, I kept to the form of Equation 11 just for the sake of simplicity. As rb mentioned, scaling should be as follows right? This is because the final transformed image(target) should have the statistical values(mean and standard deviation) of source image right? The scaling is actually correct — I provided an explanation for why in the comment reply to Rb above. Furthermore, take a look at this closed issue on GitHub for a detailed explanation. Specifically, take a look at Equation 11 of this paper. Hey Adrian. I agree with previous commenters that scaling should be inverted. The eq. 11 from original paper is correct, but your definitions of source and target images are not same as in the paper. Your method color_transfer(source, target) modifies target image using statistics from source image (at least it does correctly for mean value). But if you read paper carefully (e.g. see description of picture 2), they use statistics from target image and apply it to source image. You have good results because mean value for a, b channels have major contribution in color transfer. So I took a look at the description of Figure 2 which states: “Color correction in different color spaces. From top to bottom, the original source and target images”, followed by the corrected images …”. Based off this wording (especially since the “source” image is listed first) and Equation 11, I still think the scaling is correct. If only I could get in touch with Reinhard et al. to resolve the issue! So, you can see from pic 2, that corrected images are source image with target image colors applied, but not target image with colors from source image as in your code. That’s just for one example though, and it doesn’t follow the intuition of Equation 11. I’ll continue to give this some thought. When I reversed the standard deviations the result image ended up looking very over-saturated. This comment thread could probably turn into a good follow-up blog post. I thought that your method woudn’t much faster than using LUT with CDF histogram. Because your method have to re-build ‘Lab’ color model and calculate means and stds through every pixels in each channels. Did you compare the computational time of two methods? I don’t have any benchmarks, but thanks for suggesting that. I will look into creating some. Furthermore, calculating the mean and standard deviation for each channel is extremely fast due to the vectorized operations of NumPy under the hood. Why OpenCV does not implement any colorization algorithm ? Hi Darwin, what do you mean by “colorization”? When applying k-means clustering to both source and target images, how to find similar centroids? Simply compute the Euclidean distance between the centroids. The smaller the distance, the more “similar” the clusters are. Hi Adrian, have you tried to apply your algorithm to the pictures from the document http://www.cs.tau.ac.il/~turkel/imagepapers/ColorTransfer.pdf ? It seems to me that the example pictures you have used are not equalised exactly in the same way as in this document – the colors are there but the resulting contrast of the pictures seems not to be the same as in the source, but it’s hard to judge without using same examples. Indeed, that is the paper I used as inspiration for that post. It’s hard to validate if the results are 100% correct or not without having access to the raw images that the authors used. Good technique. But i´m not being able to port to other languages. I don´t know what the clip does ! I mean, it clips values to 255, but……Lab value are not from 0 to 255 !!! When converting RGB to Lab the values of Lab are from 0 to 100 ! If you’re using OpenCV for C++, then the cv2.cvtColor function will automatically handle the color space conversion and (should) but the color values in the range [0, 255]. You can confirm this for yourself by examining pixel values after the color space conversion. Hi Adrian. I finally make it work 🙂 I was making some mistakes on the color conversion algorithms, but now, it seems to working as expected. I´ll clean up the code and make further tests and post it here to you see. I made some small changes on the way the Standard Deviations for Luma, afactor, bfactor are being collected/ued, but it is working extremelly fast. One of the modifications i made was to avoid computing when the pixels under analysis have the same Luma or aFact/bFact. On those cases, it means that the pixels are the same, so don´t need to compute the STD operations. On this way, it avoids to you use as source and target the same image. The result without that was that the image coloring was changing bevcause it was computing the STD operations. So, one update i made was to simply let it unchanged when the values of both pixels are the same. So, it will only use the STD on values that are different from source and target. I´m amazed about the results, and deeply impressed.Congrats ! The algo works like a charm, and the scaling factor can work on different ways to determine how saturated (contrasted) the image can result. This variances of contrast according to the scaling factor are good if we want to built a function that do the color transferring and have as one or more parameters a contrast enhancer from where the user can choose the amount of contrast to be used. I mean, how the results will be displayed, if oversaturated or not. I´m still making further tests and trying to optimize the function but so far, i´m very impressed with the results. And also, it can be used to transfer from colored to grayscale images, although the grayscaled image won´t turn onto a full colored one, it may have a beautifull tone depending of the colors of the source. Btw…thinking in that subject, perhaps it is possible to color a grayscale image biased on the colors of the source ? The algorithm maybe used to do that, i suppose comparing the std of all the channels of the coloured image with the one from the grayscale and choosing the one that best fits with the target (the grayscale one). Once it is chosen, the simply trnasfer the chroma from a/b from the source to the gray image ? I’ll share my results with my friends,and i am asking if i can also share this link with them ? Sure, by all means, please share the PyImageSearch blog with your friends! Thanks for the blog post with such good stuff. But I have doubt in the suggestion you gave when using KMeans clustering. What is the reason behind finding similar centroids ? Can you give an intuition behind this ? The general idea is that by finding similar color centroids you could potentially achieve a more aesthetically pleasing color transfer. are you referring to position wise transfer using Kmeans clustering? Are you trying to transfer the color of a color image to a grayscale image? If so, that won’t work. You’ll want to research methods on colorizing grayscale images. Deep learning has had great success here. Hey Adrian, first of all – thank you for the great post and making the transfer method from the paper so easily accessible. Really great stuff! I’m fairly new to image processing but I gave this a shot, got stuck and was wondering if you had any ideas: The main problem I’m seeing with my implementation of the suggested k-means approach is that when statistics are computed in similar regions the localized transfers result in banding along the cluster boundaries. Interpolating over the boundaries feels a bit like a hack and produces unstable results. Do you have any pointers to how a localization of the transfer could be smoothed? Hey Jon — indeed, you have stumbled on to the biggest problem with the k-means approach. Color transfer isn’t my particular area of expertise (although I find it super interesting) so I’m not sure what the best method would be. I would consult this paper which I know the locality-preserving color transfer approach in more detail. Exactly what I’ve been looking for! Thanks again. But with the difference that instead of the colors of the source image, the different colors I give myself apply to the target image. the code for transfering RBG to Lab space is called cv2.COLOR_BGR2LAB, why not cv2.COLOR_RGB2LAB? It gives me a headache. OpenCV actually stores images in BGR order, not RGB order. Hi! I am curious about your statement about not resorting to Photoshop as a computer vision scientist. I see this problem more of image processing rather than computer vision. 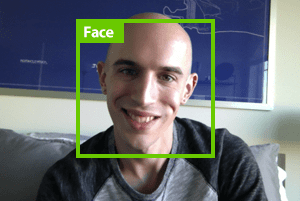 What differentiates this algorithm from the algorithm used in image processing generally? Or is it just a figure of speech that means that you can do the image processing without depending on a software? 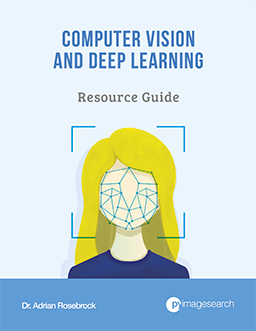 I am really enjoying these articles and just going through most of them as I just started to dive into computer vision. The general idea is that you cannot reasonably insert Photoshop into computer vision and image processing pipelines. Photoshop is a great piece of software but it’s not something that you would use for software development. As computer scientists we need to understand the algorithms and how they fit into a pipeline. I am quite impressed with the step by step explanation of this use case. Really enjoyed it. While running python file passing source and target images as arguments from Anaconda prompt, command gets executed but it does not show any output on the screen. Does the command execute but the script automatically exit? Additionally, are you using the “Downloads” section of this tutorial to download the code rather than copying and pasting? Command gets executed. It comes back to the command prompt. Please don’t copy and paste the code. Make sure you use the “Downloads” section to download the source code and example images. You may have accidentally introduced an error into the code during copying and pasting. Very nice article, and very neat algorithm. However, I just wanted to let you know my experience when implementing this and comparing with histogram matching/equalization. Our goal is to do this in real-time for creating an output video from input video. This means our budget is roughly 40 ms for doing all the image processing for a single frame. Our implementation language is C++, so I successfully ported your code to that and clocked it. Unfortunately for our images, even with ROIs, the execution time is well above 120 ms, while we could do histogram equalization with an existing histogram (pre-computed from a reference image) in about 20 ms.
You are right that histogram equalization takes longer time for larger images, and that this algorithm might scale better, but it seems like the color space conversion to Lab is way too costly for our purposes in OpenCV. Due to the limitations in what functions are supported using OpenCL (the UMat representation), this algorithm is unfortunately not easy to optimize either (e.g. split doesn’t accept UMat’s). It does however give more consistent and predictable results than histogram matching towards real images, since in some cases the LUT can become very strange if there are great differences between the histograms, and if the target histogram is too sparse (“non continuous”). May I know how to setup the source and target image? no idea how to do this. I am interested. Please help hope someone can give the complete code complete guidance. You can use the “Downloads” section of the post to download the source code and example images. I would suggest starting there.